Mr. A and I hosted dinner last weekend. Nothing too fancy; just a nice dinner with a few friends. Every time we host, Mr. A challenges me to keep things simple. Every time we host, I find a way to ignore his challenges. I know the only reason he asks me to keep things simple is so that I don't tire myself out and don't find myself in a difficult situation. A few days before a get-together at our house, I make my game plan, grab my apron and attack full force! I get so much satisfaction when I feed people so I sometimes get overly enthusiastic (and overly ambitious), decide to prepare more and more dishes and end up (happily) cooking for days for a meal that will disappear within an hour. This said, take a look at the following video. To be fair, my meltdowns are not as dramatic. And I would not say I have meltdowns; I have "moments". I call them I-can't-do-this/I-have-no-time/my-game-plan-failed/why-did-I-get-too-ambitious/should-have-ordered-pizza stressful moments. During those times, I am ashamed to say, I am as graceful as a drunk lumberjack or a sweaty sumo fighter. With great efforts to self-improve & become a better version of myself (we can all improve! ), I have been trying very hard to avoid these "moments" & stay as graceful as possible. The trick is to respect your limits. I am very proud to say that the last get-together preparations were stress-free and filled with only beautiful and happy moments. I made "Manteh", a delicious traditional Armenian dish that is similar to ravioli. They are small, crispy meat "dumplings" that you serve with yogurt, broth and spices. *Note: Fill your plate because they disappear very quickly! 1. For the dough: Mix flour and salt together. Add the olive oil and gradually add water half a cup at a time until you have a ball of dough. Add more water if needed. Knead the dough for a few minutes, place in a bowl, cover with a tea towel and let it rest approximately 30 minutes. 2. For the meat mixture: Chop onions very finely and mix all the ingredients together. 3. 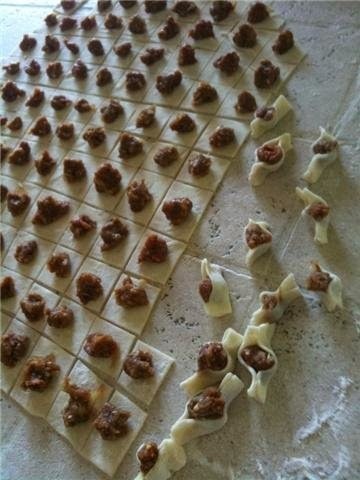 Roll out the dough and cut into 1 inch squares. Top each square with a little piece of meat and pinch two side together to form a little boat-like shape. Place on a greased baking sheet. 4. Bake for about 30-45 minutes in a 350F oven (until the top and bottom are slightly golden). 5. To make your plate: Put Manteh in a bowl, top with hot chicken broth, labneh and spices.